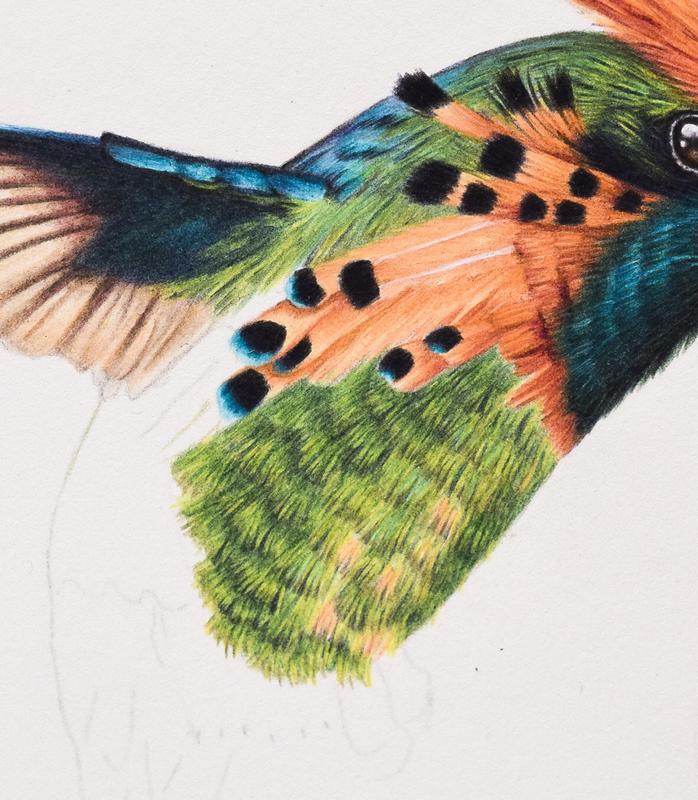 Here l have added some step by step pictures showing one way to draw feathers using colored pencils. 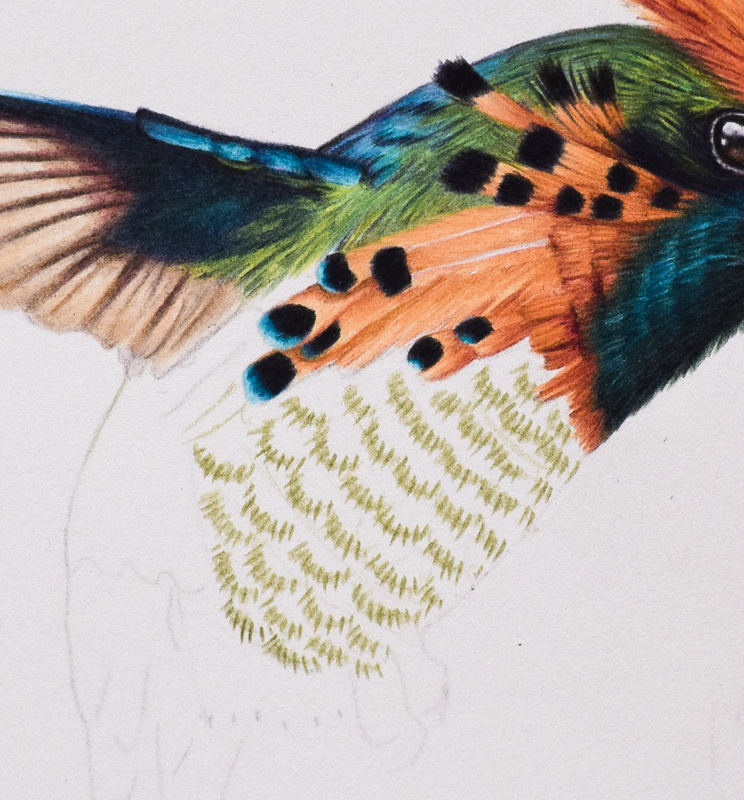 This is the way l draw hummingbird feathers, but l also use this technique on many feathers of a similar style. These feathers are a very defined type of feather, not the soft and fluffy kind. 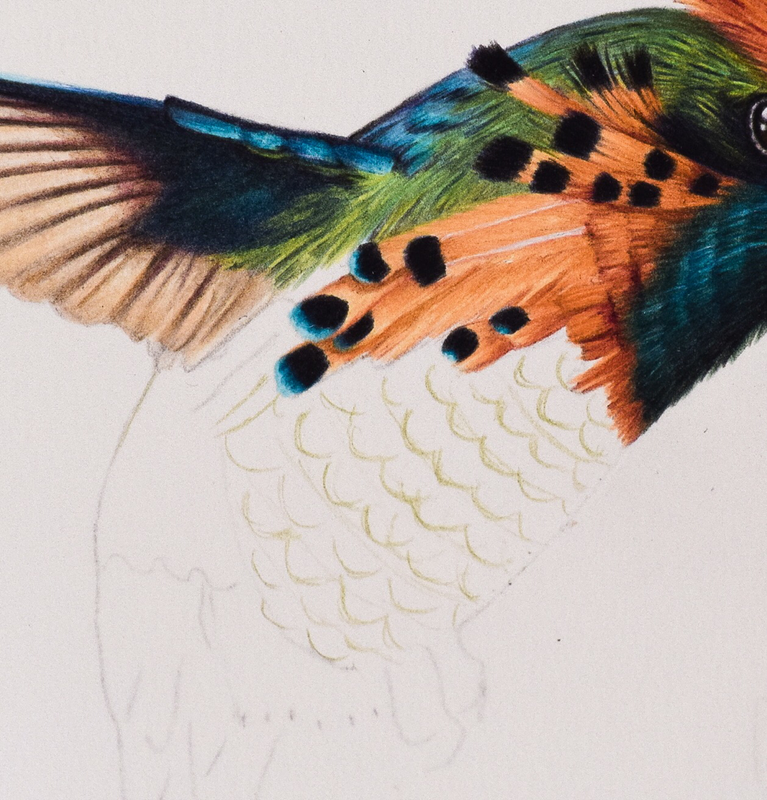 You can see just how bad coloured pencil work can look in the first stages. It takes a little confidence to keep going! ln photo 1 above l have simply drawn very lightly the rough feather shapes as a guide. You can see that l actually draw lines around the body first marking the rows of feathers (this is to get roughly the right number of rows and also to guide me as to shape - in this instance you can see that they curve gently around the body). I use light pressure and a mid tone to do this. For this piece l used Caran D’ache Pablo’s in Olive Grey. For step 2 l used the same pencil as step 1 and worked lines of varying lengths around each feather outline. These particular feathers do not have the very sharply defined edge some hummingbird feathers have. If they did l would have kept the lines around the edge all the same length. I do pay attention here to the direction the strands of the feathers should go. If you look at the photo you can see they start to fall forward towards the front of the body. I now have a guide to where each individual feather is going. All l have done in step 3 is filled in the body of each individual feather, using pencil strokes that follow the directions already set for me in step 2. I can see in my reference photo that there are some orange highlights to the belly, l mark these in with Holbein Jaime Brilliant. For the rest of the feathers l choose the lightest color l will be using Pablo’s Olive Yellow. It is funny because the step 4 photo doesn’t look a lot different to step 3! But l wanted to show it. 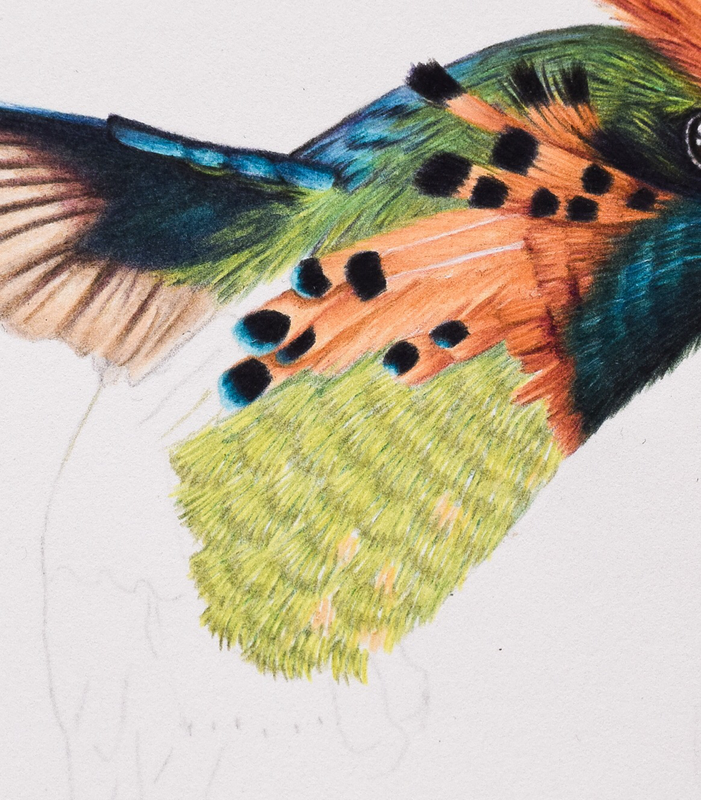 All l have done here is add a little shadow to the underneath of each feather using Faber Castell Polychromos in Pine Green on the areas that will be more shaded and Pablo’s Moss Green on the areas that will be brightest and more iridescent. Now in step 5 l begin to build the colors l want. I pay really close attention to the reference photo at this point. Really trying to see every color in the feathers and just where they go lighter and darker. I add in some highlights with Pablo’s Malachite Light Green and l add some Holbein Salmon Pink to the orange highlights. 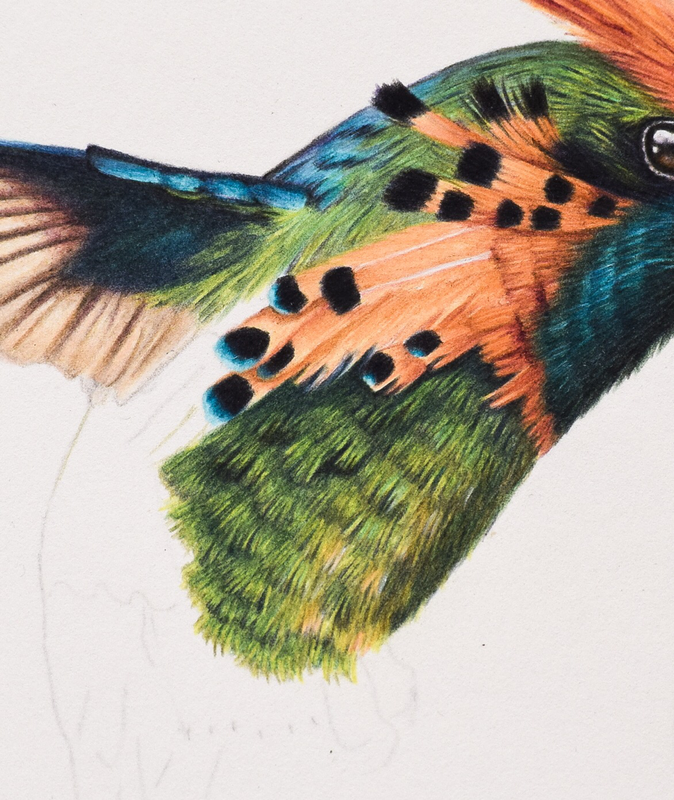 I start to add in a little shadow with Polychromos Chrome Oxide Green and use Polychromos May Green and Green Yellow on the rest of the feathers. Then l add some shade to the parts that will be darker using Pablo’s Olive Grey on the under belly and Pablo’s Moss Green on the wing side. All l have done in step 6 is begin to add a little definition, defining the edge and separate strands of each feather. I use Polychromos Pine Green and Chrome Oxide Green and Pablo’s Indigo Blue for this. ln step 7 l concentrate on defining the feathers more and adding shadow to create shape. I use Pablo’s Olive Black and Olive Grey to add shadow under each feather. 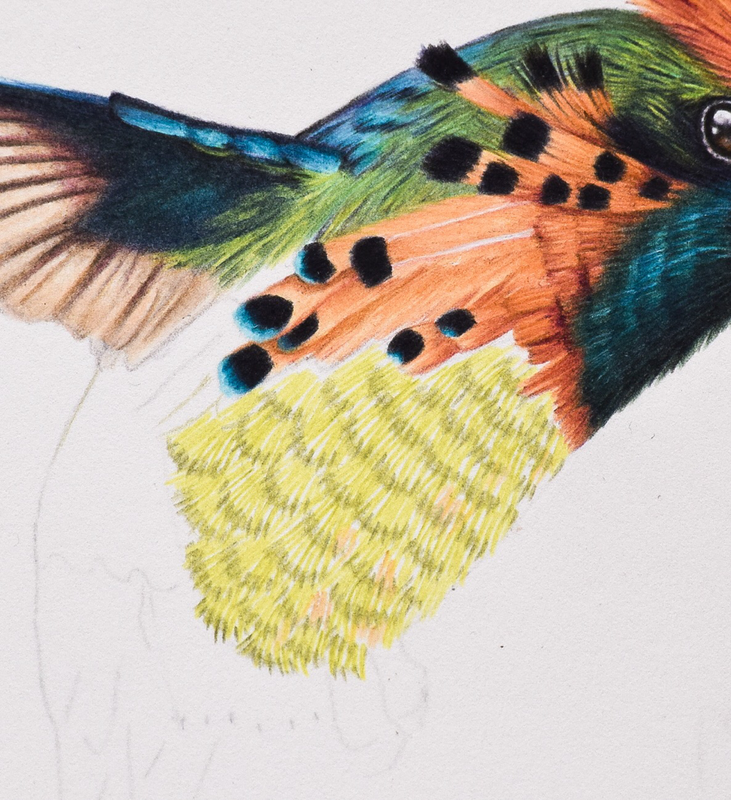 I use Polychromos Dark Indigo and Pine Green to further define individual feathers and finally add a layer of shade to the under belly using Polychromos in Burnt Sienna. At this stage l start to work the feathers of the surrounding areas before coming back to this section to add what is needed to finish it off. So it is very close to being complete at the stage you see here. But definitely not finished. Here in the last step l have colored in the surrounding areas and l can now add the final shadows and highlights and generally adjust the colors so that they work with the whole piece. I added a few highlighted strands with Caran D’ache Luminance in Buff Titanium and then more shadow with Polychromos in Indigo and Pablo’s Indigo Blue. I darkened pretty much all but the very lightest of the body area using Pablo’s in Olive Grey and Olive Black and I darkened the under belly with a little Schpirerrfarben black and last of all l used my Polychromos black to pick out the individual strands and shadows that l really wanted to recede. I am really sparing with it as it can be really tempting to get carried away when you see how much difference it makes - but too much and the impact is lost. That’s it! 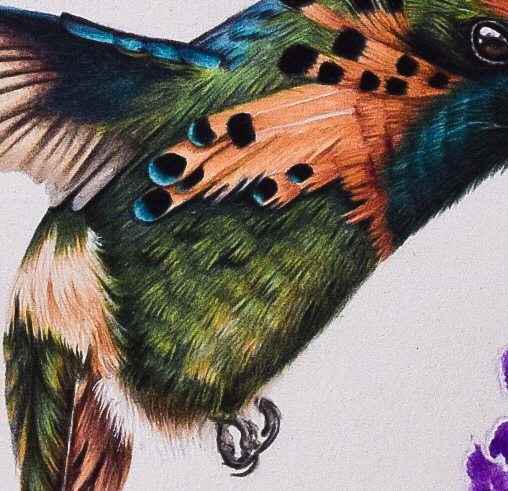 Hummingbird’s feathers complete.